Burbank, CA – The Martial Arts History Museum's DRAGONFEST convention just announced the inclusion of one of the brightest and upcoming stars in both comedy and martial arts, Master Ken. Star of the spoof YouTube comedy show “Enter the Dojo,” Master Ken, played by Matt Page, is one of the highest rated shows on the internet bringing in over 2.3 million viewers and 15,000 subscribers and counting. The Museum's Dragonfest convention, which will take place on May 18th at the Burbank Holiday Inn Media Center in Burbank, CA, is the largest martial arts convention on the West Coast. “Master Ken is without a doubt, the most entertaining comedian in martial arts history and having him as a special guest at Dragonfest provides an opportunity for his fans to meet him in person,” says museum president Michael Matsuda. 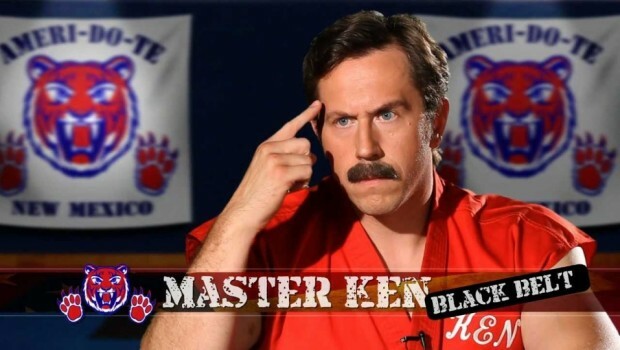 “Enter the Dojo” which is a cross between “The Karate Kid” and “The Office,” centers around an egocentric karate instructor named Master Ken. It is the brainchild of Matt Page, who is destined for The Tonight Show, The Jimmy Kimmel Show and David Letterman, has produced over 17 episodes as the show goes into its third season. The Dragonfest convention, which is designed to represent the theme of the museum, has secured some of the greatest names in martial arts history including James Hong, John Saxon, Lorenzo Lamas, Cynthia Rothrock, Eric Lee, Art Camacho, Donnie Williams, Peter Kwong, Leo Fong, Tak Kubota, Carrie Ogawa-Wong, Bill Ryusaki, Doug Wong, Benny “the jet” Urquidez, Peter Cunningham, Simon Rhee, Sol Kaihewalu, Don Baird, John Kreng, Fumio Demura and even Emmy Award-winning artist, Paul Wee. Matt Page, as the Master Ken character, plans to be a permanent fixture at the Martial Arts History Museum as he plans to donate one of his uniforms to be put on display. “Alexander Fu Sheng and Jackie Chan played a huge role in mixing comedy and martial arts. Master Ken takes it to a whole new level,” adds Matsuda. Tickets and information are available on the Martial Arts History Museum's website at www.Mamuseum.com. The museum is a non-profit 501c3 organization.